The McKee's 37 Total Glass Care BAG & BUCKET Kit is our most comprehensive detailing kit that contains our total glass care system PLUS our exterior wash system. The McKee’s 37 Detailer’s Bag is the perfect place to store all of your detailing essentials. 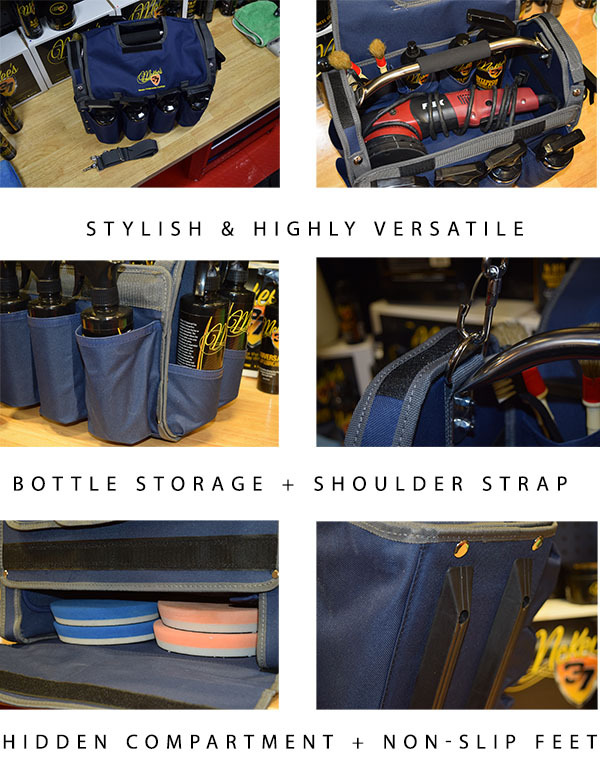 This incredibly spacious bag mimics the functionality of a handyman’s toolbox with all the features that a detailer craves. The durable McKee’s 37 Detailer’s Bag has room for it all - from your polisher and pads, to brushes and towels, and of course all of your favorite McKee’s 37 products too! Once you’ve experienced the convenience of the McKee’s 37 Detailer’s Bag, you’ll wonder how you ever detailed without it! The McKee’s 37 5 Gallon Wash Bucket Combo includes 3 essential accessories that every person needs to wash their car. This money-saving combo includes our rugged 5-gallon wash bucket that’s guaranteed not to crack after countless uses, the revolutionary Grit Guard Insert, and the award-winning Gamma Seal Lid. Just add your favorite McKee’s 37 shampoo and you’ll be equipped to make your car clean and shiny! McKee's 37 High Performance Glass Restorer actually removes etched water spots and salt spray spots from glass and restores perfect clarity. The glass polish works by gently exfoliating the surface of the glass on a microscopic level. It does not scratch the glass. The thick cream safely pulls contaminants out of the glass, including mineral deposits, and then smoothes out etched glass until it is crystal clear. It safely restores the glass in the same way jewelers rouge polishes precious metals. Your vehicle's windshield and windows will appear virtually invisible. Smoker's film and vinyl/plastic fogging is impossible to remove using a regular glass cleaner. McKee's 37 2020 Cockpit Glass Cleaner to the rescue! Apply using a soft microfiber sponge, allow the polish to dry to a haze, then buff it off. You will be amazed at how clean your glass will be. Nothing has ever worked better than McKee's 37 2020 Cockpit Glass Cleaner to remove stubborn film on interior glass. McKee's 37 Glass Coating is a super-hydrophobic nano-glass ceramic coating that creates an extremely hard, crystal-clear barrier of protection on exterior glass surfaces. Treated glass surfaces will be impenetrable to environmental contaminants while exhibiting super hydrophobic properties; water will bead up and roll off while snow and ice will be effortless to remove. A single application lasts up to one year! Mystery solved. McKee's 37 Krystal Vision cuts through oily films, even smoker's film, to reveal clean, streak-free glass. This is a whole new approach to glass cleaning. Instead of alcohol or ammonia, McKee's 37 Krystal Vision Glass Cleaner contains non-ionic surfactants. These specialized molecules are non-reactive and nontoxic. They encapsulate oil and dirt and suspend it in the water-based emulsion. When you wipe away the wetness, you wipe away the dirt. Amazingly, McKee's 37 Krystal Vision Glass Cleaner leaves no streaks or residue. This ammonia-free glass cleaner is safe on window tint. How often do you clean the leather upholstery in your vehicle? Frequent car care is easy car care, which is why McKee’s 37 developed a one-step solution to cleaning, conditioning and protecting expensive leather upholstery with All-In-One Leather Lotion. This anti-aging cream penetrates deep into the leather, lifting dirt and grime so it can be wiped away with a soft microfiber towel. The result? The leather upholstery in your vehicle will be soft, supple, and sanitary! Wipe on McKee's 37 Glass Coating with one of these absorbent, nonabrasive foam pads. The foam is a high quality, closed cell variety that resists drips and smears as it applies products evenly. This highly versatile Microfiber Applicator is ideal for applying lotions and creams to any automotive surface. This luxurious applicator features soft foam wrapped in low-nap 80% polyester, 20% polyamide microfiber making it ideal for use on delicate surfaces. McKee's 37 Coating Applicators are perfect for applying your favorite advanced surface coatings. The soft yet firm foam composition helps you to apply thin, even coats by keeping the product on the face of the applicator instead of being immediately absorbed into it. This not only minimizes waste, but it makes applying any paint, glass, or wheel coating that much easier! HAPPY FATHER'S DAY 5 I purchased this kit for my husband's father's day gift, so he has not received it yet, but he will be thrilled. He was very intrigued with the glass cleaning kit, included, but I decided to include some items for him to try as a surprise. We have an RV, so I'm sure he will invest in the new RV products and interior cleaners too. McKee's 37 Show Car Kit Free Bonus!